Black and white negative showing Larry's B.A. Inter-County Senior baseball team. This photograph was taken at Coronation Park at Walnut and Cochrane Streets. Back row: Larry Heffering, Frank Varga, Pat McCloskey, Ken MacDonald, Gord Hanna, John Milne, Mike Harrison, Al MacDonald, Fred Bidgood, Gord Neal, Jerry Frizzell. 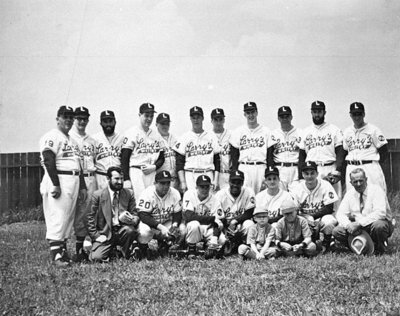 Front row: Bill Hurley, George Brabin, Gord Brown, Jackie Bell, David Hurley (bat boy), Len Yuill, Gregory Heffering (bat boy), Fred Etcher, Jack MacDonald. This team was sponsored by Larry Heffering of Larry's B.A. Service Station at 1009 Brock Street South. Larry's B.A. Inter-County Senior Baseball Team, 1956, unknown photographer, Whitby Archives, 21-004-018.